Lift is short... your lashes shouldn't be. Let’s talk lashes. You’ve heard the sayings, “eyes without lashes, are like cake with no frosting” or “life is short but your lashes don’t have to be”. They are so true! Unfortunately, we will never get our ideal lash look with serums and mascara. And who wants to fool around with strip lashes and glue. Don’t get us wrong they do help, but don’t we want full, luscious looking lashes all the time. We are so excited to announce that we can give you just that. Zaq is our new lash guru bringing his amazing techniques using Xtreme Lashes to Premier Spa & Laser Center. Forget about that classic set of lashes you are used to. He is offering the most amazing looking “Russian Volume Lashes”. You are probably asking yourself what is the difference? It is huge. Classic eyelash extensions involve the process of carefully applying a single lash extension to a single natural healthy eyelash. A classic set can only offer between 40-150 eyelash extensions per eye depending on your desired look and how many natural lashes you have to begin with. So you are asking yourself, “that sounds ok, so what is the big deal with Russian Volume Lashes?” It breaks all the rules and limitations, where Zaq can use a method of creating a “fan” of 2-6 super fine extensions and carefully attaching to one natural eyelash, allowing for more than 200 lashes per eye creating a dense, lush look. These days we all have busy schedules so we have made it easy. No-hassle office consultation needed. Zaq can review the procedure and let you know if you are a candidate all via phone. Next step, scheduling your first full set which takes about an hour and a half. Take a nap or sip some wine. Leave with gorgeous, luscious lashes, but don’t forget to schedule your 2-week fill before you leave. You won’t want to go back to normal lashes. Introductory pricing for January. Call today to schedule 302-633-4772. In mere minutes tinting gives even the finest, fairest brows and lashes a boost of color. Semi-permanent tinting can create well-defined, full-looking brows and lashes without the use of makeup. Our custom-blended eyebrow and eyelash tinting last an average of 3-5 weeks. 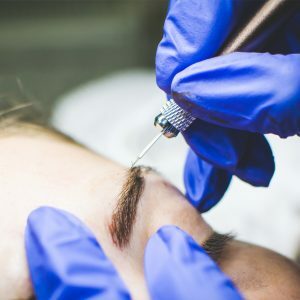 Microblading is a semi-permanent, make-up technique where a special hand tool and color pigment are used to etch hair-like strokes just under the skin’s surface. Microblading can fill in sparse brows or create an entire brow. The 3D effect adds realism to the result creating brows that look like real hair strokes, rather than a solid block, like traditional methods. The effects of this treatment can last up to two years. After your initial treatment, a thirty-day perfecting session is scheduled to retouch and fill any areas and add depth to the look. The color fades over time, and yearly touch-ups are recommended to maintain optimal results.